Is he a rocker, or does he prefer unplugged alternative, folk or maybe classical guitar? 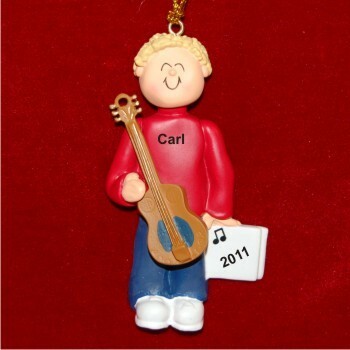 One thing we know, he'll enjoy the acoustic guitar virtuoso male blonde personalized Christmas ornament. We hand letter the name and year onto these musical instruments ornaments personalized specially for each recipient. The attached gold cord allows for easy hanging of the blonde male acoustic guitar player personalized ornament on the tree, as a charm on his guitar case or other great location. 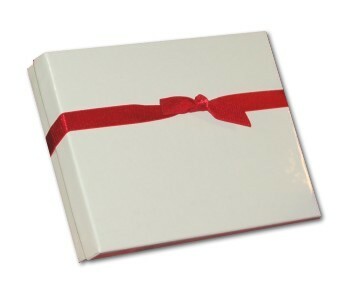 Our classic velvet gift bag is the finishing touch for this handsome, colorful guitar gift idea.